Pakistan’s famous theater organization, Thespianz Theater’s director Faisal Malik and associate director Nouman Mehmood has been nominated for “Ellen Stewart Award”. The selection process of this award was going on since two months from which eleven participants from nine different countries that is Canada, Italy, Netherlands, India, USA, Pakistan, Colombia, Lebanon and Ireland are selected for finals. According to the selection committee of this award, only those organizations and companies are selected for the award who are doing social theater in their countries and are trying to create awareness in youth about the prevalent evil issues. Thespianz Theater’s work for social change through performing arts was admired and it lead to Pakistan’s selection as one of the eleven finalist. Thespianz Theater requests the people of Pakistan and also to their admirers and supporters to help Pakistan win this award through their votes. 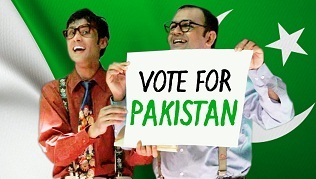 Please visit: www.ellenstewartaward.net and cast your vote for Pakistan!